Tiffani Thiessen on Wanting Babies and Being a Good Wife | Breezy Mama Breezy Mama - Expert parenting advice, celebrity interviews, product reviews for kids, moms and babies and more! Sure, Tiffani Thiessen mocked her refusal of Jimmy Fallon’s request for a Saved By the Bell reunion appearance on his late night show in a Funny or Die video joking that she is too busy doing things like practicing with her Indigo Girls tribute band and working on a live action cat comedy, but if everyone ends up loving her new show White Collar — set to premier on USA in October — as much as I do, she really will have a lot less time on her hands. For starters, there’s that nearly 3,000 mile commute she has to take to work from Los Angeles to New York where the show takes place. Twenty years?!?! In the words of Screech himself – you know, before he got creepy — Zoiks! Breezy Tip: Want to read the Breezy Mama review of White Collar plus find out what Tiffani’s co-star Matt Bomer told Breezy Mama about impulse control? Click here! When Tiffani has kids will she get them to sleep through the night? You can! Win one of several sleep related products. To enter, subscribe to Breezy Mama — it’s free! Click here! 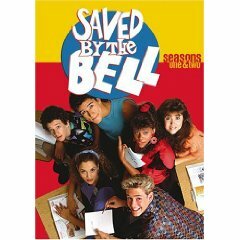 Want to catch your kids up on Saved By the Bell? Get the DVD — click here to purchase .